Cities Connection Project | LA CHAPELLE. GENEVA. This project is a prize-winning proposal of a limited entry competition organized in 2009. It contains 42 subsidized apartments from 3 to 5 rooms (1 to 3 bedrooms) corresponding in size and in cost to the strict criteria of the Genevan administration regarding social housing. 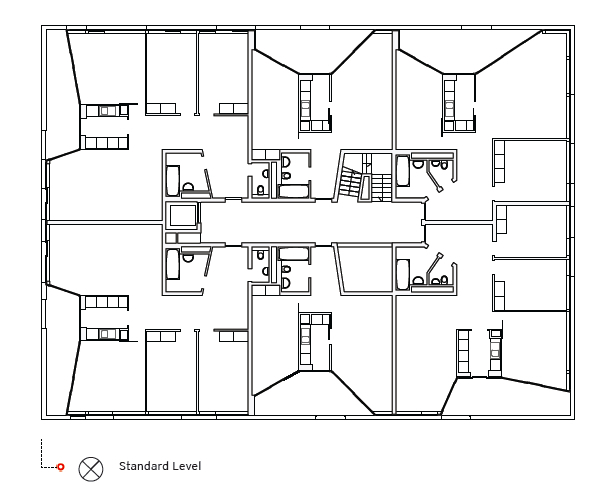 Every floor contains 6 apartments among which 4 are on the corners, distributed from a single landing receiving natural light through a shaft. The typologies of the flats have been worked so as to optimize the livable space by giving a use and higher value to each of its portions and by minimizing the unexploitable surfaces of service and distribution. The kitchen of every apartment is positioned like a block in central situation and articulates the entire common space of the apartment which includes the livable entrance hall, the living and dining room, a multi- purpose room and a large loggia. The facades design is based upon on the theme of the relation inside-outside: plate glass windows appear as a continuous horizontal chain. The height of each window varying according to its situation in the apartment, to the relationship wanted with the immediate environment and to the desired degree of intimacy. This continuity of the relationship with the outside allows to take advantage of the surrounding environment of the site situated near Geneva by creating real panoramic views. It assures a maximum contribution of natural light right in to the heart of the accommodation. 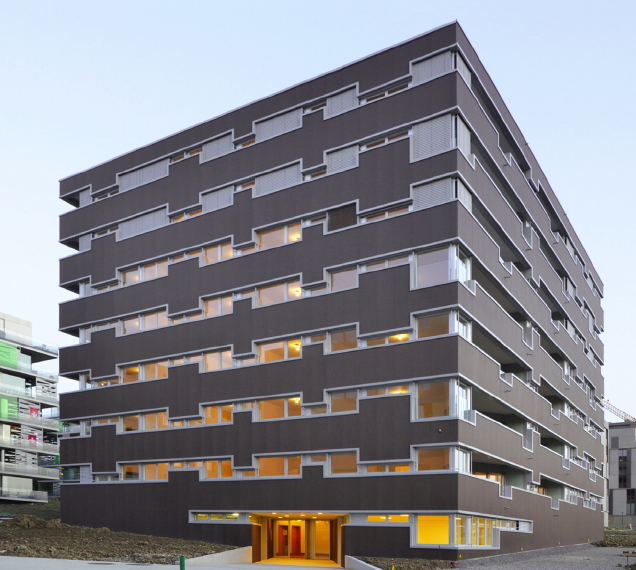 The building is dressed in tinted sheet zinc with thermo lacquered aluminum coverings. It has received the “label Minergie ©”. Loggias are included in the volume to assure the best habitability and make them a real additional room to each flat.